Designed to foster scientific investigation. Sponsored by the SRS. SLEEP 2019 opportunities offer trainees professional education, career development and networking in sleep and circadian research and academic sleep medicine at no additional cost. You must register for SLEEP 2019 and be an active SRS Trainee or AASM Student/Resident/Fellow Member to be offered registration for any Trainee Opportunity. During the registration process, you will be automatically prompted to register for “Trainee Day” if you are eligible. The Trainee Symposia Series includes seminars on the science of sleep and circadian rhythms, career development, grant writing, a leadership workshop, mentorship opportunities, breakfast and luncheon expert sessions, as well as social activities for trainees to foster a collegial atmosphere. The SRS Trainee Education Advisory Committee (TEAC) is excited for the third year of this program—a free networking opportunity for trainees. International and domestic participants who apply will be matched based on research interests into Trainee Pairs, and are encouraged to meet during Trainee Day. Network with other trainees, experienced researchers, and mentors in sleep and circadian science. During breakfast and lunch, up to 50 trainees will be welcomed on a first-come, first-serve basis to enjoy a complimentary meal and beverages. This new and improved space will remain an ‘open space’ during other times of the meeting. The Trainee Education and Advisory Committee (TEAC) has prepared this resource to encourage SRS members to reach out during the SLEEP meeting. While this was originally developed with trainees in mind, we hope all SRS members will take a moment to review and always be prepared should a trainee or junior faculty approach you. Trainees are encouraged to join the SRS/AASM Trainee Members Group on Facebook to learn about informal social gatherings during the meeting. SRS competitive awards exist to support a trainee’s effort to grow in the field. Applications for SRS Awards are limited to SRS Trainee Members. Please apply to all awards for which you are eligible and interested, attending to the requirements in the online application. Each application will be reviewed on its own merit. Only applicants who are registered for the Trainee Symposia Series at SLEEP 2019 will be considered. Trainee Merit Awards are financial awards which are approximately the cost of registration for SLEEP 2019, a certificate, and recognition in an SRS Update. To be eligible for a Trainee Merit Award, trainees must have submitted an abstract for the SLEEP 2019 meeting; complete/submit the application, attend the full Trainee Day, Sunday June 9, 2019 and submit an evaluation, on site. All merit award winners will be notified no later than March 29, 2019. Trainee Merit Awards are only distributed at the conclusion of the Sunday workshops. A completed evaluation form, available only in person on June 8, 2019, is required. No awards will be mailed. On Saturday, June 8th, 2019, a Leadership Development Workshop will be held for a select group of trainees seeking guidance in leadership skills development. The half-day workshop will include speakers, interactive panels, and small group discussions. Topics will include discussions of creating ‘work-work’ balance, managing the business of science, and effectively transmitting your research to the general public. An application is required. All workshop participants will be notified no later than March 29, 2019. Full schedule may be viewed here. 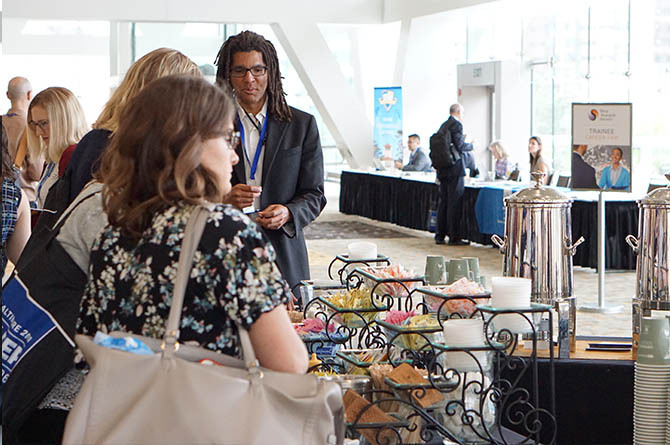 The Sleep Meeting Mentor Program offers a unique opportunity to interact with a faculty mentor in sleep and circadian research at the SLEEP meeting. This program was developed to facilitate networking and career development opportunities (e.g., CV review, grant development ideas, etc.) for trainees who show strong potential for a career in sleep and circadian research, but need additional mentorship not available at their home institution. If selected, the matching of mentees and mentors will be done based on mentor availability. No guarantees are made that the mentee trainee will be matched with one of their named ideal mentors. Please note, while it is our hope that the trainee/faculty connection will continue past the meeting, the goal of this program is to provide brief mentorship during SLEEP 2019. An online application is required. All selected for this program will be notified no later than March 29, 2019. A complete online application must be submitted no later than Sunday, February 3, 2019 at 11:59 PM. Late applications will not be considered.